Hi guys, I just noticed my R33 GTR front door trims are starting to show its age and shows some rips so it's time for me to do something that I've always wanted to try which is to wrap them in carbon fiber. Has anyone done this and how hard was it? Which time of wrap did you use and how long did it take? Also, does the wrap come with adhesive or will have I to spray it with adhesive glue? Any photos would be great! Why carbon fiber is covered thick clear lacquer coating? WTB-BNR34 intercooler pannel Wanted to buy carbon intercooler pannel Prefere OEM but still interested in a good quality copy. Fujimura Auto Rocket Dancer Carbon Front Lip R32 Gtr. Nismo GT Le-mans Group A turbos. RR581's Both were rebuilt less than 2000kms ago by Turbologic, one however will need a rebuild due to something getting sucked down the intake pipe and damaging the bearings and compressor wheel. The housings have no damage at all and would just need a rebuild, the other one just had a full build with new shaft, wheels, bearings and seals. These were making 558.4 hp at the treads on my current GTR with other supporting mods. I have spoken with CAMS and these can be used in events such as Targa Tasmania and are the largest turbos allowable for competitions that require "standard" turbo configurations. Looking for $600 ono for the pair throw me some offers...need them gone this week... Have a few standard R32 GTR parts for sale aswell... R32 GTR Crank $200 (cheapest one on here) R32 GTR Sump with Diff $100 R32 GTR Aircon Compressor $100 Standard R32 GTR camshafts with gears - $100 Standard RB26 intake manifold, no throttle bodies, does not leak and worked fine, just changed it for a plasmaman $60 Standard RB26 injectors great condition, set of 6 includes fuel rail $160 ono Standard N1 GTR front lip - $150 Universal carbon wing at the moment the stands have spacers on each side to fit in the rear stock mount of the r32 gtr however front holes need to be drilled, had it on my r32 gtr before going a different direction is height adjustable i think 25cm and 40cm and is approx 155cm long, and about 26cm wide - $350 in great condition and has heavy duty feet for stands. I can ship anything at the buyers expense, and open to offers on everything its all clogging up space and needs to go. Contact me via PM or on 0434817247 and ill try to get back to you asap. All parts are located in Wollongong, about 1hr south of Sydney. '93 GTR Freshen up Hey guys, Long time lurker. I'll try condensing the last 18 months into a relatively short post :-) A friend of mine purchased this car from the east several years ago, I remember seeing it in the flesh and the colour just popped. When it came up for sale, I jumped on it. The lads at Galvsport were commissioned to the freshen which ended up being a ground up resto of sorts. Premise was for a 1000hp street car with manners. Engineered and insurable. Carry out the school drop off and have a crack at some motorsport. Stripped the shell and off for a freshen up of the BMW Boston Green. .
Hi guys I have these parts for sale, originally was planned to use on my track cars but since both cars have been sold so I need to make room for a new project. All the parts Are brand new. Delivery can be arranged. R32 GTR Jun style carbon lip - $395 R32 GTR Carbon cooling plate - $170 R32 GTR/GTS Nismo Style carbon Trunk Spoiler $280 R32 GTR Carbon Vented head light replace - $250 R32 GTR Carbon Top secret style Diffuser - $580 R32 GTR Carbon side skirt addon - $360 R34 GTR TBO Style Carbon Canard 4 PCS - $240 R34 GTR Carbon Nismo Hood - $750 R34 GTR Carbon Ztune side skirt and rear pod - $700 R34 GTR/GTT Carbon Mirror cover - $110 R34 GTR Carbon (First Lip) - $380 R34 GTR Carbon OEM front diffuser (Second Lip) - $ 430 Also Have some R33 GTR GTS carbon parts for sale Located south of sydney PM me if you're interested Thank you. 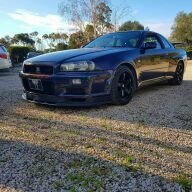 Hey guys and gals, just wondering if the N1 style bonnets that you see every now and then on the R34 Masa Motorsports kits, are they a Skyline bonnet modified or is there someone producing these awesome things?